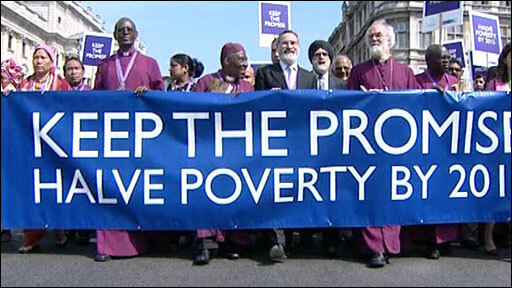 Hundreds of bishops from across the world have marched in London to demand urgent action on global poverty. The Archbishop of Canterbury led the walk from Parliament to Lambeth Palace. Dr Rowan Williams called on governments to fulfil their promises on aid and development or see the world's poor suffer disease, starvation and death. The march was joined by most of the 670 Anglican bishops attending the Lambeth Conference, other faith leaders, politicians and charity workers. Dr Williams said there was a "genuine opportunity" to end extreme poverty. But the archbishop warned that most of the Millennium Development Goals agreed by world leaders in 2000 to halve poverty by 2015 would not be fulfilled by then, and risked never being achieved at all. 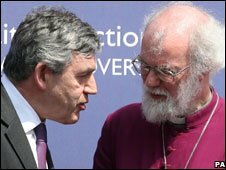 He handed a letter to Prime Minister Gordon Brown, saying the church could not stand by and let promises be broken. "In our human family the continuing consequence of failure is the death of millions of women and children from childbirth and preventable childhood diseases," the letter said. "Millions more have hopes for sustainable life diminished because of poverty-fuelled conflict, lack of education and gender inequality, all of which undermine a new generation's liberation from HIV." Climate change, global trade and economics were also having an impact on poverty, the letter said. The prime minister said the march was "the greatest public demonstration of faith" Britain has ever seen. Gordon Brown told the gathering that "100 years is too long to wait for justice and that is why we must act now". "You have sent a symbol, a very clear message with rising force that poverty can be eradicated, poverty must be eradicated and if we all work together for change poverty will be eradicated," he said. Mr Brown joined Dr Williams in warning that time was running out if the development goals were to be achieved. Other faith leaders on the march were Cardinal Cormac Murphy-O'Connor, leader of Catholics in England and Wales; Sir Jonathan Sacks, chief rabbi of the United Hebrew Congregations of the Commonwealth; the former secretary general of the Muslim Council of Britain Sir Iqbal Sacranie, and Network of Sikh Organisations director Dr Indarjit Singh. The UN meets on 25 September when there will be a review of progress towards the Millennium Development Goals. The goals range from halving extreme poverty to halting the spread of HIV/Aids and providing universal primary education, all by the target date of 2015. The Lambeth Conference brings together Anglican bishops from around the world every 10 years. This year it has been overshadowed by splits over the role of women and homosexuals in the Anglican Communion. About 200 bishops have boycotted the event. Do you live or work in the area? Have you seen the bishops marching? Send us your pictures using the form below. What is the Lambeth Conference?